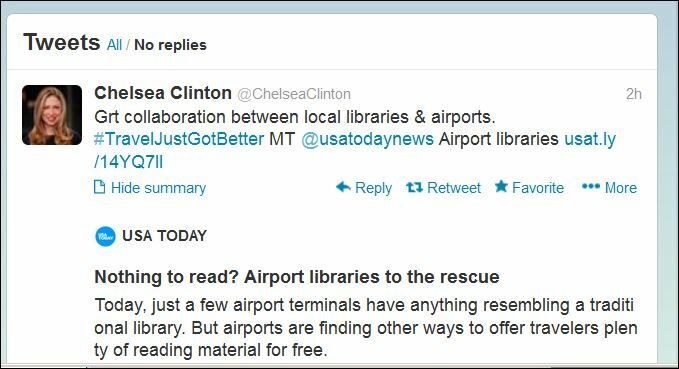 Below is a copy of my August 2013 At the Airport column for USA Today – all about airport libraries and airports where you can download e-books for free. It’s heartwarming that the story has been getting passed around a great deal on Twitter and on Facebook and, so far, has garnered at least one “celebrity” tweet – from Chelsea Clinton! The book celebrating the 75th anniversary of Nashville International Airport includes a page — and a charming photo — documenting the library branch that opened on-site in 1962. Staffed by a librarian who received an extra $4 in her paycheck to cover airport parking, the Nashville Public Library reading room was the first time a public library was ever established in a municipal airport. In addition to books, the library offered reproductions of well-known artwork for check-out. “I guess (it was) for that big dinner for the boss,” said Elizabeth Odle, photo archivist for the special collections division. There’s no word on the longevity of the “Booketerias” the Nashville library opened in the aisles of local supermarkets in the mid-1950s, but they were likely gone by 1969, when the airport library branch was shuttered. Today, just a few airport terminals have anything resembling a traditional library. But airports are finding other ways to offer travelers plenty of reading material for free. As celebrated in a recent issue of Library Journal, many U.S. airports are partnering with local libraries to expand reading opportunities for passengers who often have plenty of time on their hands while waiting for a flight. Many of these partnerships take advantage of complimentary airport Wi-Fi and the fact that so many people now travel with an e-reader, tablet, smartphone or other mobile device. In 2011, Florida’s Fort Lauderdale-Hollywood International Airport (FLL) and the Broward County Libraries Division joined forces to create the first airport program offering free e-book downloads to passengers. Screens found in all airport baggage claim areas now display QR codes that can be easily scanned to give travelers access to an e-library of more than 15,000 free titles. Library-sponsored airport e-book download programs are also underway in Kansas, where the Kansas State Library has brought its Books on the Fly campaign to Manhattan Regional Airport and in Pennsylvania, where the Free Library of Philadelphia has set up a special free Wi-Fi spot in the Terminal D/E connector to lead passengers to a splash page that provides access to free e-books, author events, podcasts, historic city photos and other resources. In March 2012, Michigan’s Traverse Area District Library brought its Books on the Go program to the Cherry Capital Airport in Traverse City. Signage with QR codes and instructions are posted in the airport’s baggage claim and terminal areas with links to a collection of literary classics that can be downloaded for free. No library card is needed and airport director Kevin Klein reports that library e-book usage has increased 211% per month since the partnership started. And this summer passengers at Seattle-Tacoma International Airport (SEA) may download free e-books or take home free paper books and magazines from Quick Reads Shelves set-up beside rocking chairs, thanks to the King County Library System‘s (KCLS) award-winning Take Time to READ program. County librarians take turns going to the airport to help travelers choose reading materials or sign up for a library card. The librarians also re-stock the shelves with books that are all new and all donated from sources that include the library’s foundation, a local newspaper book reviewer and area booksellers. Since December 2000, passengers have been invited to pull up a chair in the San Francisco Airport Commission Aviation Library, which is inside the aviation museum in the international terminal at San Francisco International Airport. The collection includes 8,000 aviation-related books as well as periodicals, photographs, technical drawings, oral histories, and archival materials. Most books are kept in locked glass-fronted cabinets, but research requests are honored and browsing tables with some books and periodicals are laid out in the public reading room. Checkouts are also not permitted at the 24-hour, self-service reference library that opened in 2010 at Amsterdam’s Schiphol Airport, but a librarian is on duty about an hour a day to re-shelve books and help passengers choose something to read during a layover. Some books removed from the Schiphol Library show up a few weeks or months later and passengers sometimes leave extra books behind. But because the library focuses entirely on Dutch art and culture, “I can’t accept the Dan Browns and Stephen Kings; we put those in a special book-swap corner,” said Deckers. A dedicated 24/7 book swap area was established at Finland’s Helsinki Airport in 2012 for passengers to pick up a book, drop one off or just spend time sitting and reading. “Book Swap gives a peaceful moment and there is the idea of recycling and spreading joy, since quite often people either throw away or leave the book in the seat pocket,” said Johanna Metsälä, customer experience manager for the Finavia Corporation, which manages the Helsinki Airport.